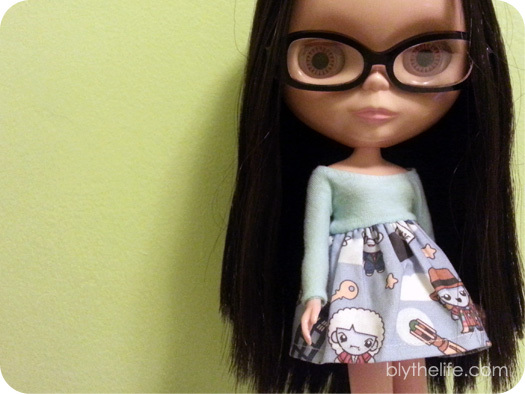 BlytheLife.com » QOTW: What is your current favourite outfit? 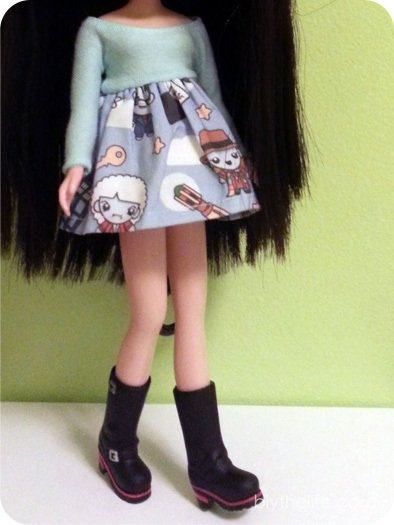 Sometimes I put together an outfit for one of my Blythes that I just love. And this isn’t me bragging or being boastful, I just really like some of the outfits that I put together sometimes because they just fit the doll. This isn’t to say that there’s anything wrong about saying that you think your dolls look good in an outfit that you’ve put together. You should think it looks good because it’s your doll, your doll clothes, and you put the whole shebang together! That and nobody is going to walk around saying “Gosh, I put my Blythe in the most horrific outfit today. Want to see the photo I posted of it on Instagram?” – because that just makes it sound like you’re fishing for compliments. The dress is by ericaduh, the boots are Jackie Ramone (Middie) stock, and I cannot remember where I got the glasses from. But it’s a pretty awesome outfit – if I do say so myself. What is your current favourite outfit? Share a link to a photo of your favourite doll outfit below! QOTW: Your favourite pair of shoes?